New Camera in a month, I promise! I’ve been ill all weekend so after the Fitter London classes on Saturday, I came back home and stayed on the sofa till bedtime. Today, Sunday, I was in bed till 6pm. I feel better now but I definitely have another 15-20 hours of sleep left in me. Also, I’ve been advised to eat less non-organic (read: pumped full of hormones) meat, which will be explained another time, and find other sources of protein. With the second point in mind, I bought a 500g bag of chickpeas (100g contains: 164 calories, 2.6 grams of fat (of which 0.27 grams is saturated), 7.6 grams of dietary fibre and 8.9 grams of protein) and had NO idea what to do with them… yes, I was a chickpea virgin! I’ve had hummus/humus a couple of times but I’ve never cooked chickpeas in my 30 years! A couple of days ago, I soaked them in water for 8 hours (as advised by many sources online), drained and stored in the fridge for future use – I’m so happy I did that! Add chickpeas to a pot with just enough water to totally submerge them. Add herbs and salt, bring to boil (medium heat). Slice onions and add to the pot. Allow to cook for 10 minutes (increase heat a little). Add the mixed vegetables, and allow to cook for 5 more minutes. Cut up the mackerel and add it with the 2 tablespoons of tomato puree and allow to simmer for 5 minutes. I’d have definitely cooked the chickpeas in chicken/meat stock if I had any in the freezer as that would have given the meal more flavour. To save yourself a lot of time, use pre-soaked, canned chickpeas. You can be as adventurous or boring (like me) with your vegetables. Verdict: It was tasty! And very filling 🙂 Enjoy! 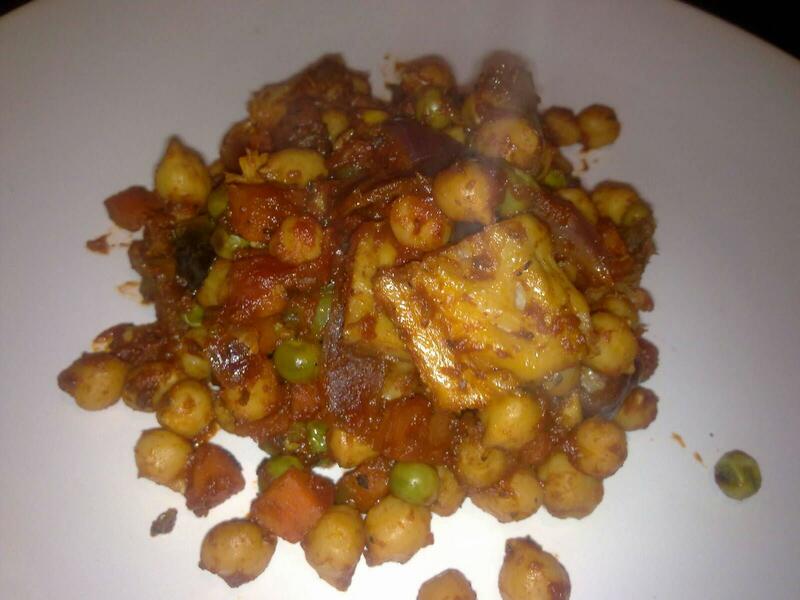 This entry was posted in Eat In, Healthy Eating, Recipes on November 27, 2011 by Adura Odesanya.